Following his 1970 departure from The Guess Who, guitarist Randy Bachman recorded a solo album (Axe) and planned a project with ex-Nice keyboardist Keith Emerson (later canceled due to illness) before forming Bachman Turner Overdrive in 1972. Originally called “Brave Belt,” the metal group was comprised of singer/guitarist Bachman, fellow Guess Who alum Chad Allan, bassist C.F. 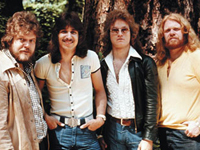 “Fred” Turner, and Randy’s brother, drummer Robbie; after a pair of LPs (Brave Belt I and Brave Belt II), Allan was replaced by another Bachman brother, guitarist Tim, and in homage to the trucker’s magazine Overdrive, the unit became BTO.